Family: My husband James and I have been married for 10 years, and we have a 4-year-old daughter who is in transitional kindergarten at Denair Elementary School. Experience and education: I graduated from Modesto Junior College with an AA. I then attended CSU Stanislaus where I received my BA in liberal studies with a concentration in English. I also minored in speech communications. I have a multiple subject teaching credential as well as a supplemental English authorization. I did my student teaching in Denair and was then hired to teach first grade. 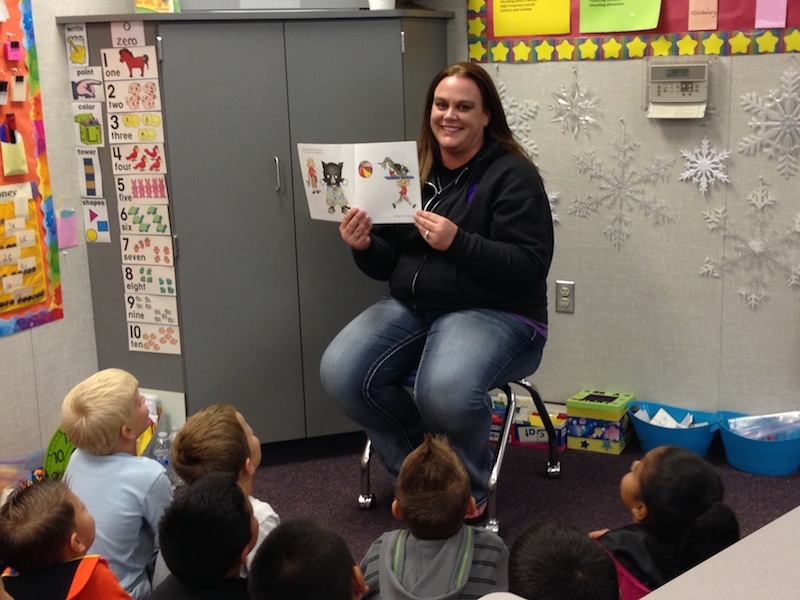 I have been teaching for 12 years, all of which have been in first grade at Denair Elementary School. What most inspires you about teaching? What inspires me the most about teaching is seeing the excitement on my students’ faces when they have learned something new. Their excitement for learning inspires me to push myself and grow as a teacher. What are your biggest challenges as a teacher? The biggest challenge is that there are too many great activities and projects that promote learning and never enough time to do them all! What is your favorite teaching tool or activity? I love technology! A few of my favorite technology tools are my ELMO (document camera), projector and computer. We live in a technology-driven world and technology is a great way to engage students in learning. As much as I love technology, I also love a plain old piece of paper and a pencil. There is so much that we can learn and create using just the basics like paper and pencil. How has Common Core affected your classroom strategy? Common Core has increased the amount of student conversations happening in the classroom. Students not only need to master concepts, but they need to be able to explain and defend the reasoning behind their answers. Common Core really allows students to think deeply and have meaningful conversations about their learning. What do you want your students to remember? I want my students to remember that learning never ends and even as adults they will learn new things. I want them to be excited about the fact that they will be lifelong learners! How can parents support what you do? Communication between home and school is extremely important. Having open lines of communication between teachers and parents allows students the opportunity to maximize learning in both environments. What will it take to improve academic success in DUSD? The amount of support my students and I receive from the district, parents and community is amazing! Students getting the support they need at school, home and in the community will allow them to be successful. Students need all the adults in their lives working together to help them accomplish their dreams! What’s next in your classroom? I am very excited to announce that my students will soon be participating in STEAM activities! STEAM, which stands for science, technology, engineering, arts and math, is an integrated way of teaching across the disciplines and is project based. I want my students to refer to themselves as scientists, technology wizards, engineers, artists and mathematicians! It is full STEAM ahead for us! What would surprise people about your job? My job is never boring! I wake up every day and can never predict what the day may entail, but I know that it will definitely be exciting and memorable. Posted in News and tagged Class Act, Denair Elementary School, Kelly Beard. Lexie Galvan liked this on Facebook.